KOMO-TV, the ABC affiliate in Seattle, has found itself in a bit of a name mixup. The station, which was covering Peyton (note the spelling of “Peyton”) Manning’s new touchdown record, put up an OTS with what it thought was Manning’s photo. The photo was actually of Gary Payton (note the spelling of “Payton” here). Not only is the spelling of “Payton”/”Peyton” different, the latter is a last name while the former is a first name. The two men, while both professional athletes — at least they got that right — don’t even play on the same team. Nor do they play in the same cities. Heck, they don’t even play the same sport. Gary Payton played for the NBA before retiring in 2007, while Peyton Manning is a current Denver Broncos NFL player. 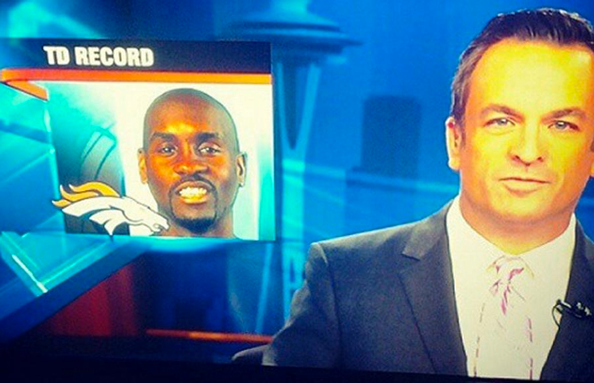 It also doesn’t take a ton of close observation to note that Peyton Manning is white, while Gary Payton is black. Gary Payton himself took note of the error and tweeted about it.